Jacob Vernon ("Vern") Kindsfather was born December 12, 1924 in Portland, Oregon. By 1940, Kindsfather's parents, Jacob and Mary (née Wacker) Kindsfather had moved across the Columbia River to Vancouver, Washington. It is believed that the Jacob Kindsfather family is from Dietel and Brunnental, Russia and Mary Wacker's (Walker) family is from Norka, Russia. Kindsfather attended the University of Portland and began his professional baseball career with the Vancouver Capilanos of the Western International League in 1948 and 1949. 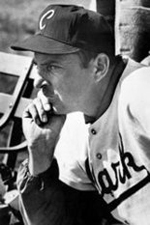 Kindsfather spent five of his eleven professional seasons pitching for the Seattle Rainiers where he compiled a 21 game winning season in 1952. He also played for the Portland Beavers in the Pacific Coast League, Tulsa in the Texas League and Tri-Cities in the Northwest League. Kindsfather was known as a workhorse and fierce competitor who ranked amongst the best pitchers in the league during his time with the Seattle Rainiers. During a season with the Salem Senators, Kindsfather pitched a perfect game (a no-hitter) against Eugene facing only 21 batters in a 7 inning game. During World War II Kindsfather was a radarman with the U.S. Navy in the Pacific participating in nine major battles. After retiring from professional baseball, Kindsfather continued coaching baseball for 25 seasons at Clark College in Vancouver, Washington before retiring in 1986. Vern Kindsfather died on December 21, 2008 in Vancouver, Washington at the age of 84. After discontinuning the baseball program for several years, Clark College reinstated their team in 2011 and named their newly renovated facility, Vern Kindsfather Field. In 2012, Kindsfather was honored as a member of the Clark College Athletic Hall of Fame. Vern Kindsfather died December 21, 2008 in Vancouver, Washington.